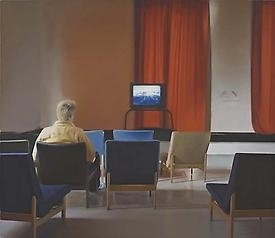 PAUL WINSTANLEY "Man Watching TV 5", 2003 Oil on linen 39 3/8 by 45 3/8 in. 100 by 115.3 cm. JESSICA STOCKHOLDER 2006 Mixed media Installed: 103 by 26 by 19 in. 261.6 by 66 by 48.3 cm.